The coordinator of the atheist bus campaign, Ariane Sherine, has just announced that the final phase of atheist (last ‘installments’) bus adverts are being displayed this week in London, Edinburgh, Cardiff and Belfast (the capitals), however not on buses this time but on billboards! 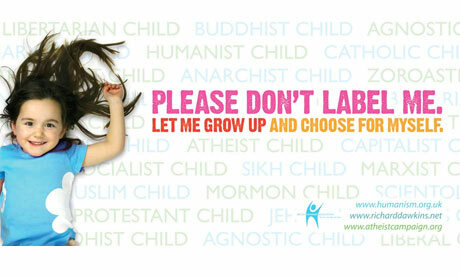 The adverts target the indoctrination of children. 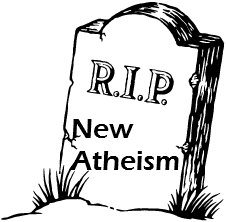 I wonder whether one could argue that the neo-atheists are in their turn a kind of indoctrinating preachers? Should not Dawkins’ children summer camps be seen also as ‘indoctrinating’ camps? I hope that Ariane sees the irony of this last campaign! A polemic started on Guardian website on whether a schism begins to emerge within the atheist ‘movement’ (but some don’t even see atheism as a movement). The polemic is getting hotter and hotter (by the day, if not the hour). It was started by Michael Ruse with an article “Dawkins et al bring us into disrepute”. In this article Ruse unleashes a devastating attack against “new atheism”, seeing it as dangerous as all religious forms of fundamentalism. Here is the final paragraph from Ruse’s article. “Back in 1961, in the depths of the cold war, terrified as we were by the threat of nuclear annihilation, John Whitcomb Junior and Henry Morris published The Genesis Flood, a six-day-creationist account of origins. Because of its dispensationalist message – God clears things out every now and then, as he did at the time of Noah, and we should expect the next (literal) blow up fairly shortly – it became the fundamentalist bible. But don’t worry. It’s all part of God’s plans, even the Russian bomb. Today, nearly a decade after 9/11, terrified as so many still are by the terrorist threat, the atheistic fundamentalists are finding equally fertile soil for their equally frenetic messages. It’s all the fault of the believers, Muslims mainly of course, but Christians also. But don’t worry. In the God Delusion, we have a message as simplistic as in The Genesis Flood. This too will solve all of your problems. Peace and prosperity await you in this world, if not the next. Forgive me if I don’t sign on”. I am looking forward to see where the debate will go.